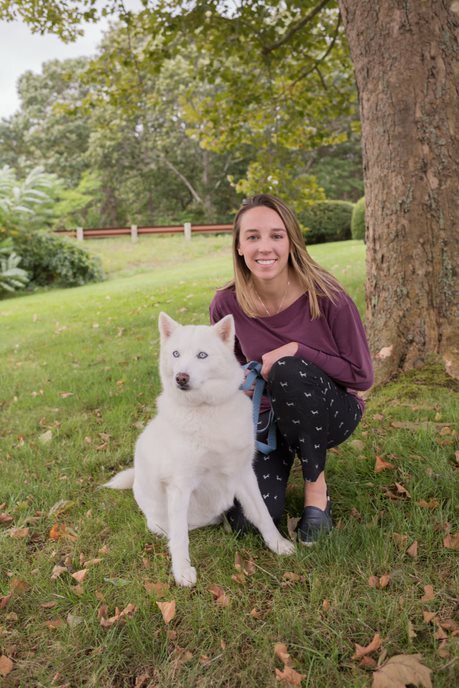 Dr. Michelle Jenssen is a 2018 graduate from Cummings School of Veterinary Medicine at Tufts University. She received her undergraduate degree in Biology at the University of Massachusetts Amherst where she was also a member of the Track and Field team. She grew up in Mansfield, MA and now lives in Plymouth. She has a husky mix named Ally and two cats named Fiona and Sprout. Her interests genetics animal reproduction and prior to veterinary school, she worked as a human Embryologist at a hospital in Boston. She also loves the ocean, and was previously an intern at the New England Aquarium and studied Oceanography in Rhode Island. She loves working at Oceanside because of the wide variety of species she has the opportunity to work with and learning something new every day. Her special interests are small animal surgery and medicine and since starting at Oceanside, exotic animal medicine as well. Her favorite activities outside of work are taking her dog on hikes, going to breweries and exploring the cape.